With over one million square-foot spread over five halls at the NEC and 2500 vehicles on display, the Classic Motor Show promised much for the visitor who paid just short of £30 for their ticket. That being said, the proportion of those square feet devoted to two wheels was restricted to part of Hall 5, with the remainder of the show given over to the four- and, in some cases, three-wheeled variety of automotive delight. That is by no means a criticism but you needed to look at everything to get the full value from your entrance fee, not just the motorcycles. 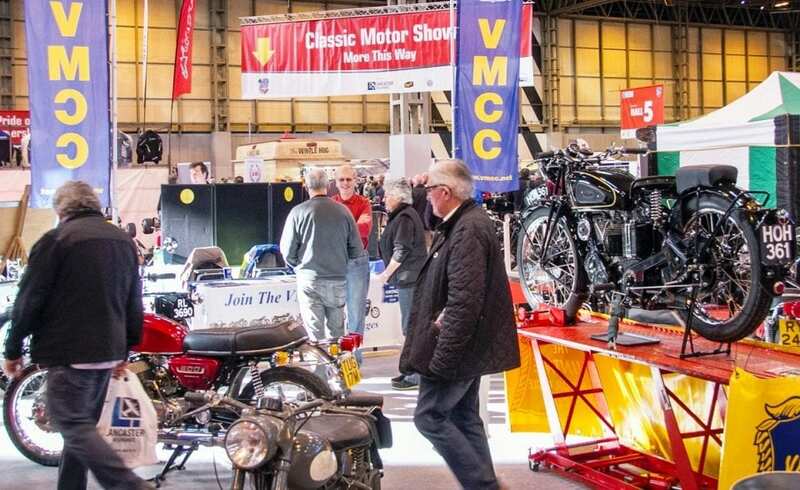 It must also be said that the motorcycle area was a triumph of quality over quantity with some very interesting machines on show, not only from the major single marque clubs but also some lesser known organisations. I particularly liked the Clifford Arms Classic Bike and Car Club from Great Heywood in Staffs, who showed an eclectic group of interesting machines, whilst the Awfully Pleasant Scooter Association was not a name you are likely to forget. Comte Jules-Albert de Dion and the engineer Georges Bouton eschewed the early attraction of steam power after being won over to the delights of the internal combustion engine, and by 1895 their first four-stroke engine was revealed to the world. 1897 saw the launch of the De Dion Bouton tricycle whose 211cc engine produced 1½hp and which drove the rear axle via a pair of gears, all encased in a steel frame courtesy of a firm called Decauville. By 1904, when the last model was introduced, capacity had increased to 955cc and 8hp was being produced – sacre bleu as they may have said in France. I will admit to not having a clue as to the year or model of the one you see here as I failed to get the whole of the registration number but I’m sure PUB would be able to tell you if asked. Move forward just a few years to look at this 1911 Singer which the National Motorcycle Museum had brought along. Singer were another manufacturer that started out with tricycles but moved to a more conventional two-wheel format in 1904 when you could have 2hp or 3hp output, chain or belt drive. Things then went quiet for several years but then in 1911 Singer sprang back into life with a 3½hp, 499cc model which came with magneto ignition, a free-engine clutch and Druid forks; this was closely followed by a 2½hp version. Two-wheel manufacture moved on with different models added to the range but by 1915 it came to an end due to WW1 and Singer went on to focus on cars after the war. 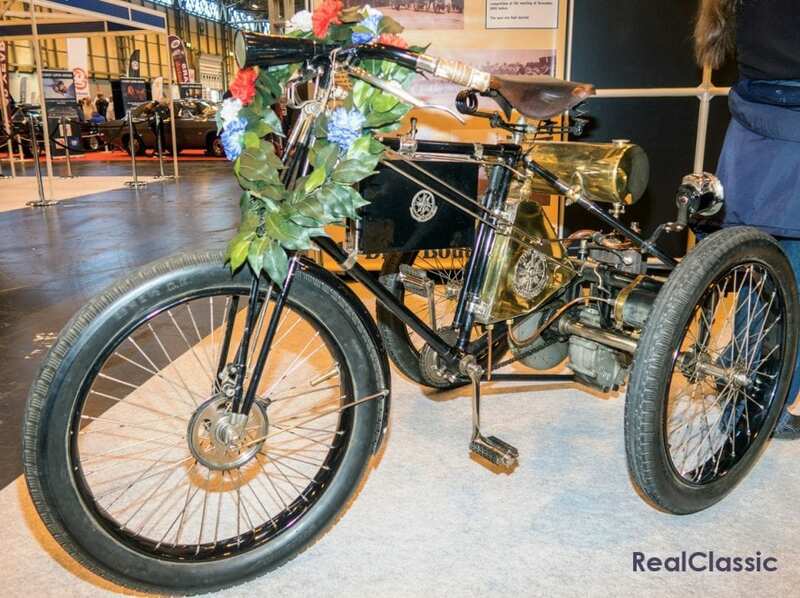 This immaculate example is from 1911 and is one of the 2½hp models with a 265cc sidevalve engine, Bosch magneto, B&B carburettor and Druid forks; the belt drive had an adjustable pulley which provided ratios from 5 to 7 to 1. All this and only £53 when new – which equates to around £19,000 today (if you use the labour value index). 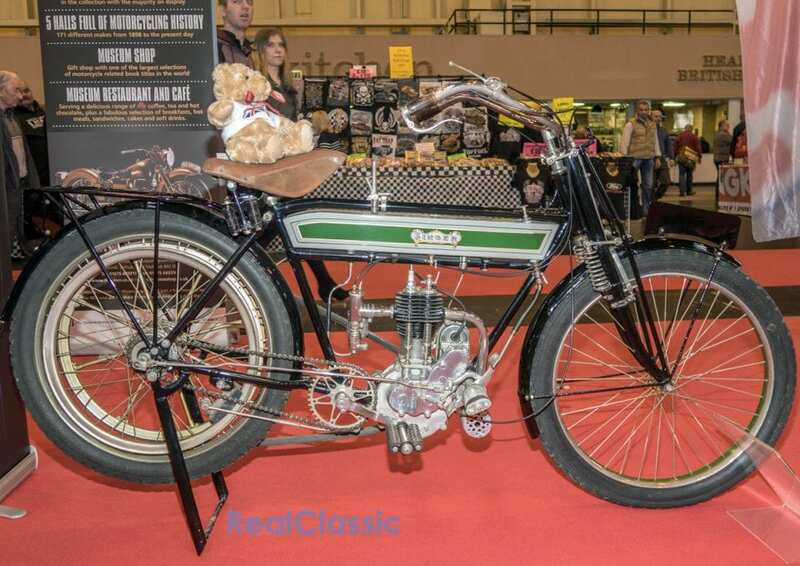 Moving over to the aforementioned Clifford Arms Classic Bike and Car Club stand, we find this rather attractive Bown nestled amongst the larger bikes on display. Bown is a story in two parts, the first being from 1914 to 1923 when Snow Hill in Birmingham saw machines being built first with Villiers and, later, Blackburne and JAP engines. Scroll forward and down in Tonypandy, where previously the Aberdale autocycle had been built, the name Bown was adopted in 1949 and a new design of autocycle, with a Villiers 2F engine and a girder-forked frame, appeared the following year. 1951 saw a motorcycle with a Villiers 1F engine, all of 98cc, with a two-speed gearbox, with the Tourist Trophy model appearing the following year with a Villiers 122cc engine and telescopic forks. 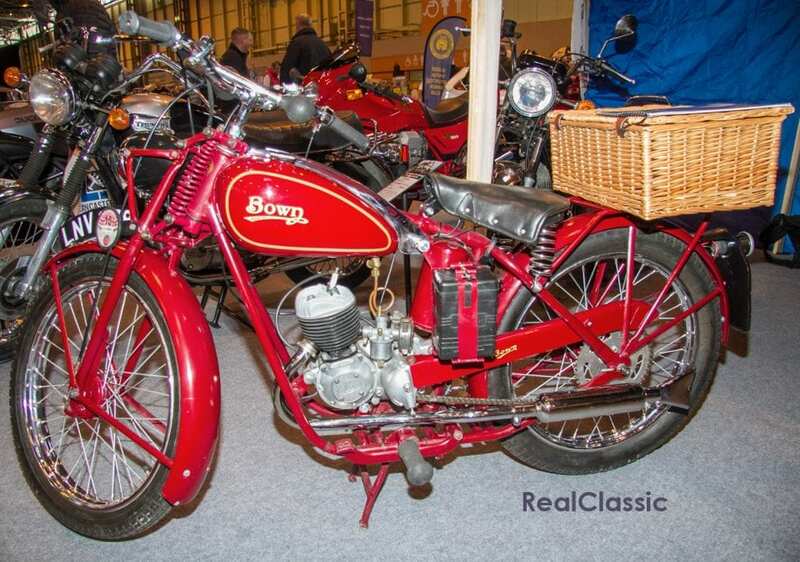 The example at the NEC was first registered in 1955, which was close to the end of the second Bown incarnation, and it’s a 98cc De-Lux motorcycle, resplendent in a very eye-catching paint job. 1954 saw the end of motorcycle production and although a Bown-badged 47cc Sachs moped appeared in 1956 it only lasted two years. 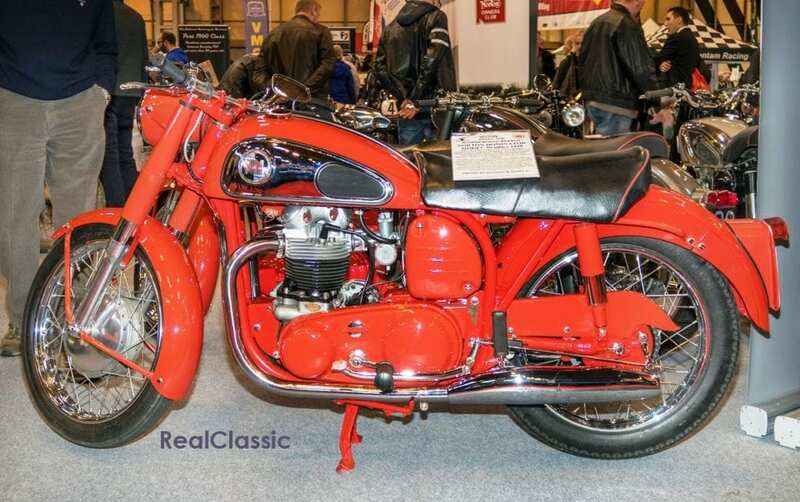 Keeping to the red theme, Comet Classics brought along this handsome 1957 Moto Guzzi Lodola with its 175cc ohc engine looking ready to go. The first Giro d’Italia in 1953, a road race for machines up to 175cc, was used to encourage Carlo Guzzi to design one more engine before he retired and thus out flew the Lodola, or Skylark, from Mandello Del Lario. The over-square engine has a chain driven camshaft, to avoid the use of expensive bevel gears, with a novel chain tensioner designed to compensate for different expansion rates. The cast aluminium alloy engine used valves with coil springs, featured a Dell’Orto carburettor, had a 7.5:1 compression ratio and produced 9hp at 6000rpm which went via a four-speed gearbox to the rear wheel. A full duplex frame, with telescopic forks at the front and swinging arm at the rear, was fitted with drum brakes, and the whole weighed in at about 240lb. 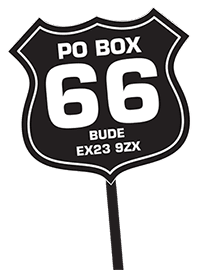 This version of the Lodola was said to be good for 68mph. 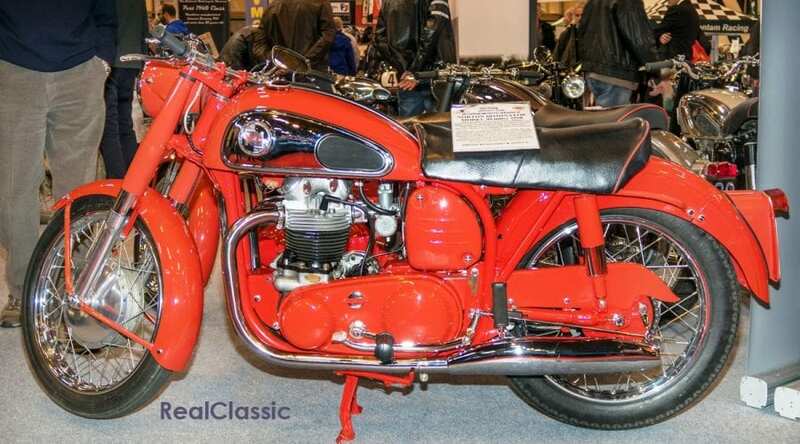 The 1958 Sport version, with a 9:1 compression ratio, could do 75mph, but the later 235cc version was said to be solid and reliable if not exciting. 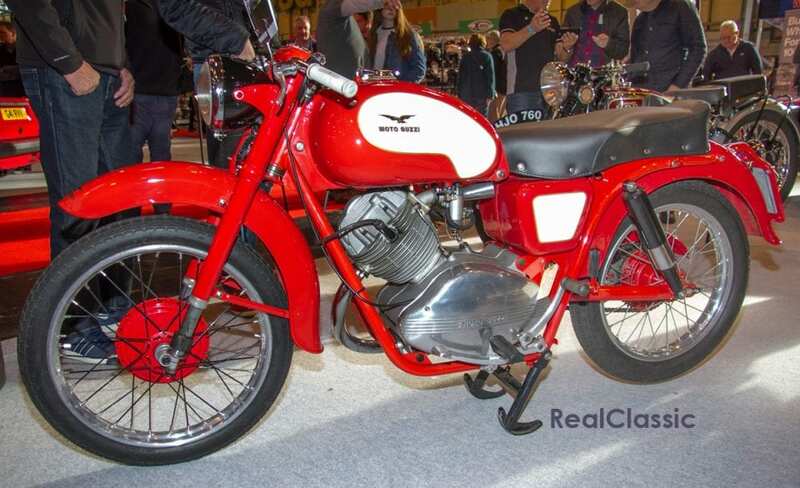 A 247cc Sport Lodola was seen at the Milan show in 1965 but the model was dropped that year. If you want to own the one you see here then you’d need to hand over £4995. Before we leave red motorcycles I just had to show you how red a Norton Dominator could be, this one acting as a lighthouse for the Norton Owners’ Club stand. A 600cc Model 99, it left Bracebridge Street in 1958 which was, apparently, the first year that the Dominator featured alternator electrics rather than dynamo and magneto. The wideline featherbed frame and the rest of the bicycle left the factory in this stunning red which has recently been resprayed to make sure the visual impact is undiminished.